Get expert advice on asbestos compensation claims with a free, no obligation consultation. 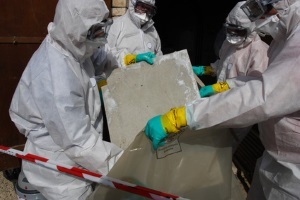 Anybody who has been exposed to asbestos fibres or asbestos dust for even a small amount of time is at risk for developing several serious diseases including mesothelioma, which is fatal. Other health conditions that have been linked to asbestos exposure are lung cancer, pleural thickening, pleural plaques and asbestosis. These risks were recognised and proven sometime in the early 1990s. Immediately after the link between asbestos exposure and the above conditions became known, all employers were notified about the dangers of asbestos and asked to put necessary precautions in place. Despite this, several instances of asbestos exposure are still being reported across the UK, either due to negligence or by accident. Irrespective of the direct cause of exposure, the employer is liable to pay compensation to the person or persons who may be affected. The risk from asbestos arises not just from direct contact with asbestos but also from indirect exposure to its fibres and dust. This means you could be at risk if you touch the clothing of a family member who works in an asbestos-related industry or even if you live a short distance away and breathe in air that contains asbestos dust. According to the law, if your injuries are related to asbestos exposure, you may be entitled to claim compensation, irrespective of whether or not you are or were at any time employed in a related industry. The compensation covers physical injuries, emotional trauma, ongoing expenses for medical treatment and medications, nursing care if necessary and loss of income. Funeral expenses may also be included if the death can be linked to asbestos. If the company that you are filing the claim against has since closed down, the claim can be filed against the insurance company that covered the establishment at the time that the incident occurred. If you are planning on filing an asbestos/mesothelioma claim you should be aware of the statute of limitations so you do not lose out on the compensation due to you simply because of a technicality. An asbestos/mesothelioma claim must be filed within three years from the date that you first became aware about the diagnosis. It can take several years from your actual exposure of asbestos until you notice any symptoms. In the case of a fatal injury, the compensation case must be filed within three years of the date of death. If the asbestos link was known only after the death through a post mortem examination or a coroner’s inquest, the case for compensation may be filed within three years from the date of awareness. Although the decision ultimately lies with you, here are some of the reasons why it is advisable to hire a personal injury solicitor to represent you if you are planning on filing a compensation claim for an asbestos-related injury. Filing an asbestos claim can be complicated. It involves several complex legal clauses that you need to be aware about if you want to get the maximum compensation that you are entitled to. If you file the claim on your own you may overlook some of the losses you are entitled to claim. An experienced personal injury solicitor would know all of the losses that you can claim for and will do their best to get you the maximum compensation. Personal injury solicitors also have access to expert medical professionals who have experience dealing with asbestos-related conditions and their progression. For example, there is an extended latency period of about 35 to 50 years from the time of exposure to the onset of symptoms. When the symptoms start to manifest they may seem minor but an experienced doctor would be more knowledgeable about the possibility of the symptoms become more severe with time. With this knowledge your solicitor could negotiate a larger sum of compensation to cover future inconveniences and losses including any psychological injury. The compensation for psychological trauma by itself can be quite significant. Putting together an asbestos/mesothelioma claim by yourself within the three-year time limit can be challenging especially when you consider that you will also have to juggle your personal and professional commitments as well as your ongoing medical treatments. A solicitor would focus exclusively on your case so you can get it filed within the time limitation. A legal advisor would also be up to date on the most recent legal provisions pertaining to asbestos exposure and will use that to your advantage. Another huge advantage of hiring a personal injury solicitor is that they know what evidence is needed to substantiate your claim and will give you the best advice in this respect. Overlooking just one seemingly trivial piece of evidence can result in you losing a considerable percentage of the compensation due to you. For most people, one factor that acts as a major deterrent against seeking legal advice is the thought of the high fees involved. Fortunately, that is not something you need worry about when looking for a solicitor to help you file an asbestos/mesothelioma claim. If you have a strong case, most personal injury solicitors will agree to help you fight your case on a No Win No Fee basis. This is also called a Conditional Fee Agreement. The agreement states that the solicitor will help you collect and put together all of the evidence, file the case in court and represent you at every hearing without asking you for any upfront fee. Only after the case has been decided in your favour and you receive the compensation amount, you will need to pay the solicitor the amount that both of you have mutually agreed upon at the time of signing the contract. The amount you have to pay is usually a percentage of the total compensation you receive and only after you’ve received it so you are never out of pocket at any time.